On Monday I was once again MC for a large scale IPBA event. 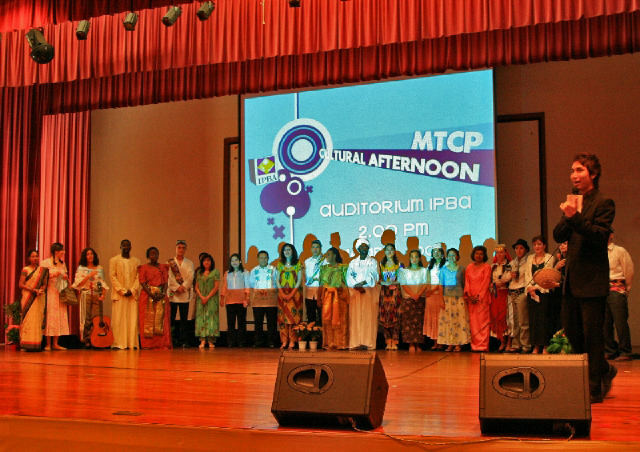 This time it was for the MTCP Cultural Afternoon. My partner was a shy Nishya who was uncomfortable at first but, half-way through the event, she picked herself up & ended the event with great confidence. Because of that, I think she did really well as an MC that day & will continue to do so in future events. The MTCP participants are professionals in the education system from select countries around the world brought to Malaysia, given a hefty allowance, sent on tours around Malaysia & of course, made to attend a fun & simple course on the latest English language teaching research. They were a group of 25 ppl that originated from countries like Bhutan, Kosovo, Oman, Sudan & Philipines. 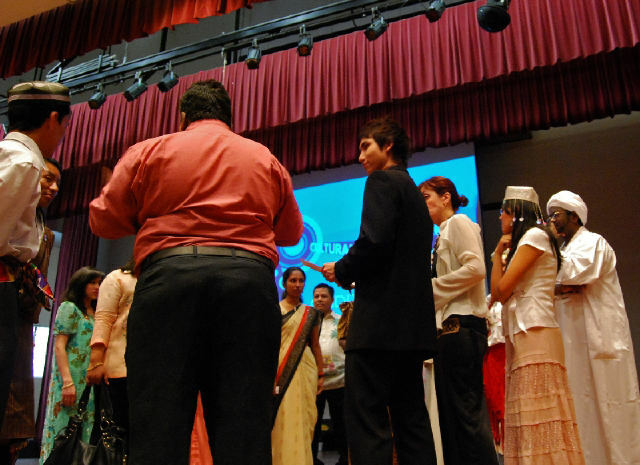 And last Monday, they had to present an aspect of their cultures to the students & lecturers of IPBA. When he come in, he took over & made the show his show. He didn't ask permission from the student organisers & he overruled student opinions without much consideration. Because of this, he offended many of the students who have actually already put a lot of thought into the event. This caused every students involved to be demoralised. Many grudgingly consented to his demands while others left the team. Perhaps it was not totally his fault. When he came in & took over, the student organisers were in a state of shock. When he rejected their ideas & bossed people around, the students got offended. The students were unforgiving, vengeful & silent about it. They were unwilling to stand up against him & confront him by defending their thoughts and ideas. They resorted to feeling bad about it & being resentful. Because of his one-man-showness & the students' resentment, the planning of the event fell apart. Students were reluctant to attend rehearsals, none of the students knew the flow of the presentations until an hour before the event begins & there was a lot of confusion about how things should be done. Nerve racking indeed. I chose to be professional. I sympathised with my friends while maintaining my enthusiasm as it was necessary for an MC. I was civil & confident in voicing my opinions, even though it conflicted with the lecturer's, and I was firm when defending my decisions, even though the lecturer tried to change it. In the end, both sides accepted the way I wanted to do my part of the event & my part went really well. The event was good & everyone put in an effort. There was also something really really good during the event! A special thanks goes out to the supportive & overwhelmingly vocal crowd! Even though the cultural presentations were somewhat ordinary, you cheered, sang along & clapped as if it were a rock & roll concert! You made the event happening!! This is probably the effect of not making the event complusory; ensuring that those that were there actually wanted to be there. Here's a pat on the back for the crowd! And a hug for my friends! As well as a handshake for the lecturer! When Did I Become So Needy?